Sunday afternoons in San Diego are great for relaxing at the beach or catching up with friends over French toast and mimosas, but not on this particular Sunday. 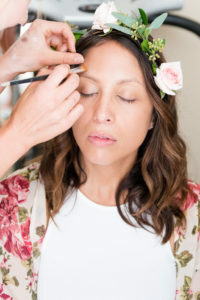 Over a dozen female entrepreneurs, from stylists, to florists, to chefs, flocked to the seaside neighborhood of Bird Rock to put on one of the most beautiful, colorful and creative events that I’ve seen in a while. The day was dedicated to collaboration over competition, and joining creative forces to put on a successful photo shoot made up entirely of volunteer vendors and models. At half past noon I made my way up the sidewalk to the Bird Rock house. The weather was cool, accompanied by an ocean breeze with a touch of warmth from the ever-shining California sun. Beyond the gate of the house, I could hear the voices of women at work inside. It wasn’t long before the event coordinator, Tiffany Accardi, greeted me. As she scurried from room to room, keeping the day on schedule and giving a helping hand to what seemed to be every part of the event. Tiffany is an entrepreneur from San Diego and founder of the national Meetup group, Gals That Brunch. The Meetup group is how I first met Tiffany and got to be a part of this inspiring day, but I’ll share more about that another time. This day was about capturing the spirit and essence of Gals That Brunch with a three-themed photo shoot made of up models from its very own community. From the outside looking in, the house was abuzz. Culinary artisans creating in the kitchen, Hair stylists braiding and curling countless heads of hair. Jewelry designers matching wardrobe pieces to a perfect set of accessories. Not to mention florists, makeup artists, set designers, photographers and of course, the models. And where did all of these fabulous people come from, you might ask? I wanted to know too, so I asked around and found out that most, if not all, of the female entrepreneurs are part of a community called Rising Tide Society and its spinoff group, Tuesdays Together. From what I could gather, it seemed like the event was about entrepreneurs coming together to share their gifts and create and capture something beautiful, which they did! 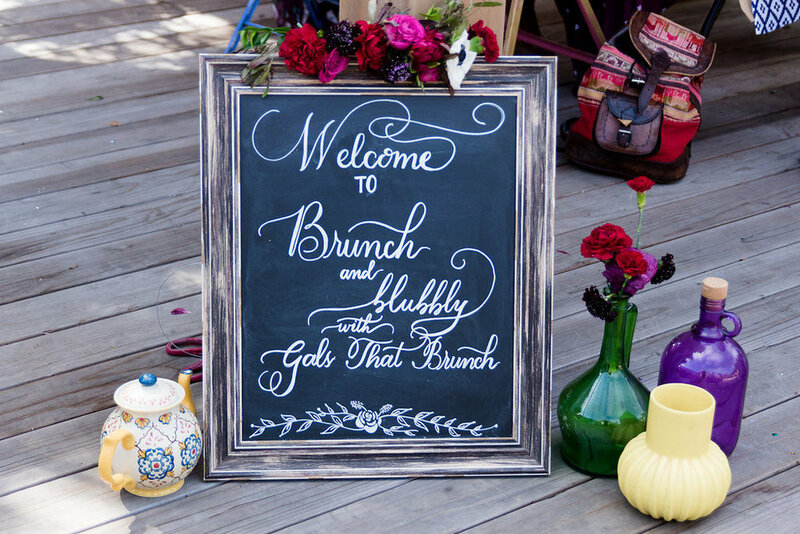 As the day progressed and more people arrived, the three themed photo shoot was coming together as sets were created to capture each motif: a European style tea, a bohemian brunch, and a mimosa pop bar. 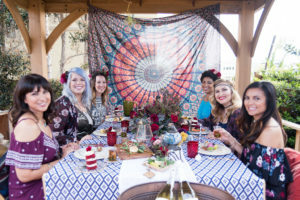 Each theme had it’s own color scheme, with the Euro-tea table designed with airy pastels, like pinks and creams; the bohemian brunch featuring bold jewel tones, like deep reds and blues; and the mimosa pop bar with an array of bright and fun color tones and to my delight, a splash of glitter! It seemed as though the day went off without a hitch and no shortage of inspiring sights to see. Although the main event was a photo shoot, the magic was in the details, with a spirit of collaboration over competition bringing it all to life!